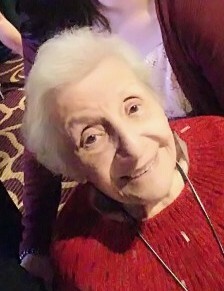 Obituary for Naomi Kouyoumjian | Vraim Funeral Home, Inc.
Naomi Kouyoumjian nee Keleshian passed away on November 14th 2018 surrounded by her loving family. She was the beloved wife of the late Albert. Loving mother of Elaine Gaspare, the Twins Sue (Bob) Ritter and Lucy (Jim) O'Donnell, Tom and Ed. Devoted grandmother of 12 grandchildren and 11 great grandchildren. Friends and family are welcome to call on her immediate family from 10am to 11am on Saturday, November 24th at Vraim Funeral Home, Inc. 66 S. State Rd Upper Darby, Pa 19082. A Memorial Service in her honor will take place in the funeral home at 11am.